Voting in a conclave is the heaviest and most visible responsibility that comes with a red hat, but those under the age of 80 — the cardinal’s retirement age — also influence the work of the offices of the Roman Curia and serve as special papal advisers. Along with a red biretta and the assignment of a “titular” church in Rome, new cardinals are appointed members of Vatican congregations, councils, commissions and secretariats; they are not simply advisers to those offices, but full members whose vote is needed for the most important decisions and documents issued by each office. The statistical impact of Pope Francis’ choices for new members of the College of Cardinals will be small, but significant. The expanded group of cardinals eligible to elect a pope — all those under the age of 80 — will include a lower percentage of Europeans, a slightly lower percentage of Italians, a lower percentage from the United States and a higher percentage of cardinals who head dioceses rather than offices of the Roman Curia. After the new cardinals are created Feb. 14, the college will have 125 members under the age of 80 and, therefore, eligible to vote in a future conclave. The total number of cardinals will rise to 228 — a record-breaking number. If a papal election were held the next day, more than 45 percent of the world’s cardinals — all those over the age of 80 — would be locked out of the Sistine Chapel where the conclaves are held. Much of the reaction to Pope Francis’ announcement Jan. 4 of the identities of the new cardinals focused on how they give representation in the college to Catholics in some of the most remote parts of the world — the “peripheries” the pope is always talking about. 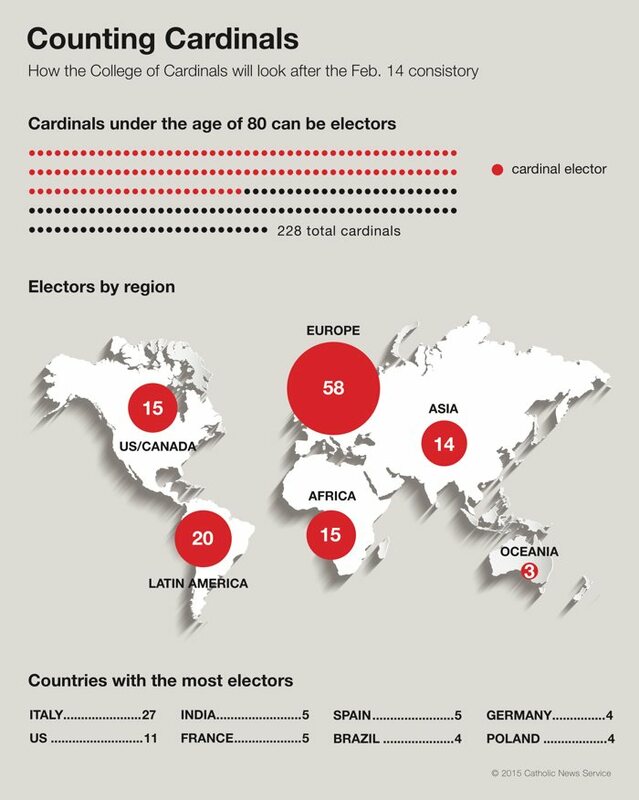 With the addition of electors from Ethiopia, New Zealand, Vietnam, Myanmar, Thailand, Uruguay, Panama, Cape Verde and Tonga, the number of countries with electors will rise from 48 to 57. Among the electors, the percentage of Europeans will drop to 46.4 percent from its current 48 percent. While not a huge change, it is a sign of continuing progress in making the college more representative of the church as a whole; in 1960, there were 79 members of the college and they came from only 27 countries. About 70 percent of the college at the time was made up of Europeans. Borrowing a category from the world of politics and economics — the Group of Eight countries with the most advanced economies — even after the consistory the world’s most powerful nations still will have a majority among cardinal electors. But instead of representing 61 percent of the electors, the G-8 countries’ share will drop to 57.5 percent. With the Argentina-born pope’s latest picks, the percentage of Latin Americans will rise to 16 percent from its current 15.4 percent. Pope Francis named no new members from the United States or Canada, so that part of the world’s percentage will fall to 12 percent from its current 13.6 percent. After the new cardinals receive their red hats, the percentage of Africans will rise to 12 percent from 11.8 percent. The percentage from Asia will rise to 11.2 percent from its current 10 percent. And, the Oceania-South Pacific region, which had only one voting-age cardinal, will have three; that brings the region’s percentage up to 2.4 percent from its current 0.9 percent. Bringing new members into the college rejuvenates the body, although in the past several decades the average age of cardinal electors has decreased only slightly with each new intake. Two of Pope Francis’ picks — Cardinals-designate Soane Mafi of Tonga and Daniel Sturla Berhouet of Montevideo, Uruguay — are still in their 50s. However, after the consistory, the average age of the whole block of cardinal electors will decline only by five months, dropping to 71 years, one month. As far as the age of the new cardinals goes, Pope Francis is well within the norm for the past several decades when the average age of incoming electors has been between 65 and 68. The last time the average age of a batch of new cardinals was less than 60 years old was the 1977 consistory in which Pope Paul VI created four new cardinals, including then-Archbishop Joseph Ratzinger. The average age of that group was 57.2 years, according to catholic-hierarchy.org, the leading website for statistical information and brief biographical data of all the world’s bishops and cardinals.